Leh is the district headquarter of Ladakh situated at an altitude of 3500 metres. 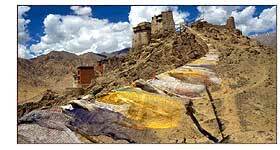 Hemis, the largest of the gompas, founded in the 17th century, is the most accessible of all the monasteries in Ladakh. Other monasteries are Shey (15 kms. From Leh), Spituk (8 kms. From Leh), Thiksey (17 kms. From Leh). Leh is connected by flights from Delhi, Jammu and Chandigarh. If you are in love, visit Leh, even if only with the Hills. This fantastic place in Ladakh has a dreamy landscape, and a cool weather, with some of the most colourful people in the world. An old school of Tibetan Buddhism, the rituals of the folk are as interesting as their handicrafts and behavior. And by interesting I mean, interesting, very interesting, for scholars and layman alike. The administrative capital of Ladakh, Leh, is situated at an altitude of 3505 m from the sea level and falls in Jammu and Kashmir. In the map you'll find it at the head, in northernmost part. The Leh Palace - The 17th century palace closely resembles to that of Lhasa, both in architecture and styling. The top of the namgyal hill, and above the palace is the Victory tower, towered in the memory of victory over Kashmiri Balti army. The Namgyal Tsempo gompa - Built by King Tashi Namgyal, this gompa, with a gold idol of Buddha and some rare artifacts of architectural splendour, this gompa , on Namgyal Tsemo peak is worth a visit, if only human eyes are still open. Leh mosque - The mosque presents an amalgamation of Trkeyish and Indian architecture and a splendid monument in Green and white. Spituk Gompa - At a distance of 8 km, this Gompa is one of the best Buddhism architectures of 15th century, most probably for the Buddhist monks' meditation and learning. Shey - The Shey palace and the adjacent Gompa is a major attraction for both general tourists and Buddhist devotees. The game of sunlight and the Hills of Shey is a never surpassable natural beauty, and the religious monuments of the place attract hoards of people. 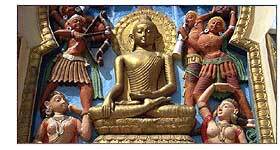 The Buddha figures and the numerous murals is some of them. Air - Leh airport is connected to all major Indian cities. Rail - Rail routes are not convenient since they are far, nearest station is at Jammu. Road - Road journeys, rather say, safaris are exciting, the main route being Leh-Srinagar-Leh. In Leh, hotel Singhe Palace could be a good option for a stay. Besides, there are guesthouses to experience local customs and lifestyle.